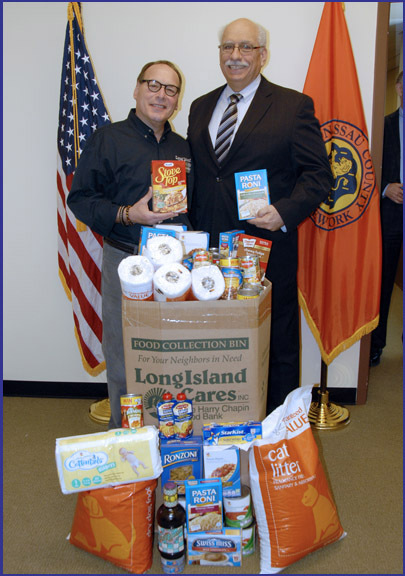 Nassau County Legislator Dennis Dunne, Sr. joined with Long Island Cares Executive Director Paule Pachter to promote and participate in the food drive to stock the Long Island Cares-Harry Chapin Food Bank. Legislator Dunne and many others donated non-perishable food, household cleaning supplies, personal care items, baby care items, and other supplies to help Long Island’s hungry. This year the food bank is seeking additional donations of pet food to help feed hungry pets. To donate, please bring items to the Nassau County Legislative Building lobby at 1550 Franklin Ave, Mineola or see www.licares.org for other donation options. Every bit helps!! Shown in the photograph are: LI Cares Executive Director Paule Pachter and Nassau County Legislator Dennis Dunne.